This Baked Potato Soup is so quick it might become a weeknight staple! I bake the potatoes in the microwave to save time. The peel just comes right off after they are cooked. Cook potatoes in the microwave until soft. Let them cool to the touch, and peel and dice (they might fall apart and that’s ok). In a large pot, cook bacon until crispy. Remove bacon from the pot, reserving drippings. Cook onion in the bacon drippings until tender, about 5 minutes. Then, stir in flour and cook for one minute. Gradually add the chicken broth, whisking constantly, until mixture is thickened and bubbly. Add potatoes, salt and pepper. Cook for about 5 minutes over medium heat, until the soup is heated through. Add up to a cup of milk to thin the soup to your desired consistency. Add the cheese and sour cream and stir well until the cheese melts. Serve with extra sour cream, the crumbled bacon, shredded cheese, and chopped green onions. 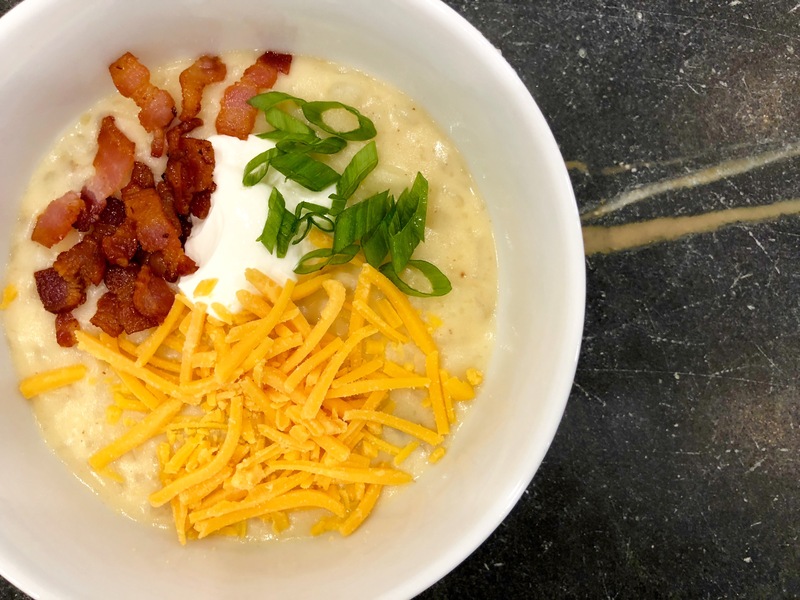 Copyright © 2018 Our Everyday Dinners - This is an easy recipe for how to make Baked Potato Soup.